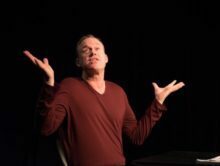 A Minor Mid-Career Retrospective, a Toronto Fringe Festival show by American performer James Judd currently playing at the Factory Theatre Studio, is an excellent example of the art of the humourous monologue done well. For an hour, Judd was able to take amusing stories from his own life and, through his energy and skill, keep his audience enthralled and laughing. Judd’s comedic monologues set the standard for their form. After an exciting career doing things as varied as practicing criminal law and running a vineyard, James Judd came to fame with his comedic autobiographical monologues, most notably featured on NPR‘s Snap Judgement. Each night’s performance of A Minor Mid-Career Retrospective will bring together a different collection of Judd’s stories, three or four of these fitting into a single night’s performance. Judd has a great sense for the dramatic, for building a well-constructed story with an eye for telling detail. His first story in A Minor Mid-Career Retrospective suggests his talent for drama was cultivated early on, when Judd was a fifth grade student in California and his fascination with the kidnapping of Patty Hearst led to a summer job for his mother watching and summarizing her favourite soap operas. Judd’s talent for taking reality and making it a compelling drama was put to good use in his other stories, leaving his audience on the edge of their seats as he explained how he ended up punching a shark off the coast of New England, or just why he celebrated his 36th birthday in a Chinese brothel. Judd’s skills as a dramatizer of everyday life are not by themselves enough to ensure the success of A Minor Mid-Career Retrospective. Judd’s skills as a performer give this show its power. Whether sitting down or pacing about the stage, Judd is able to engage his audience, using his clear speaking voice and his open body language to have his audience follow him as he proceeds through each of his stories. When he reaches a climax–when he describes, for instance, how he defended his book review choice to his appalled teacher–the audience reaches it with him. A Minor Mid-Career Retrospective is a success, proof that James Judd is a talented comedic monologist. My only complaint is that each night’s changing selection of stories means that, in coming nights, he will be telling all-new stories that other nights’ audiences would miss out on. Content Warnings: Smoking, Sexual Content, Mature Language. Photo of James Judd provided by company.